Commercial salmon season just opened on the California Coast. Sport fishing for salmon has been open for several weeks now and a friend of mine who crews on a few sailboats out of Moss Landing has shared both the prized Dungeness crabs and fresh salmon fillets from her friends at the harbor. In exchange, I’ve sent fresh pineapple upside-down cake back to her friends as a small thank you. What I’ve found is that those who fish love freshly baked desserts. Works well for all of us! 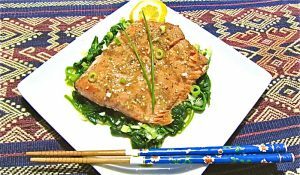 Usually I love the fresh salmon lightly poached in wine with a little vanilla salt and pepper or pan grilled and finished with a pat of butter and a squeeze of fresh lemon or lime, as the flavor of such fresh fish is so delicious! But sometimes it’s fun to pull out the stops and make a special sauce and serve the salmon with roasted baby new potatoes or a simple risotto and a lovely fresh salad. 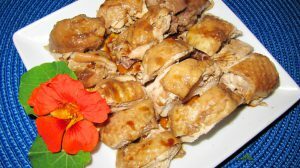 This is a recipe that I first had in Florida in 1997 when I was a participant at an orchid festival in Florida. The chef at the Mayfair hotel where the event was held, made some very memorable meals, and his Salmon with Curried Rum Sauce was delectable, though very rich. And yes, he used vanilla in the sauce. I’ve toned it down a bit, but it’s really, really good even without quite so much butter and cream. I oven-poached this salmon in white wine. It’s difficult to provide you with an exact time it will take to cook the salmon given that fillets and steaks are not standard sizes and ovens don’t always cook evenly. The trick is to pull the salmon when it looks a little under-cooked as it will continue to cook for several minutes after it’s removed from the oven or stove-top. 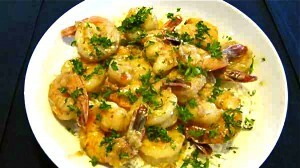 Better a little under-cooked than over-cooked as fish becomes dry very easily. You can always put it back for one or two minutes if necessary. I’ve decorated the salmon with chives fresh from the garden and chive flowers. 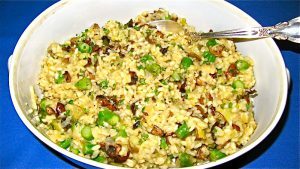 Use chopped parsley or thinly sliced scallions instead if you don’t have chives. 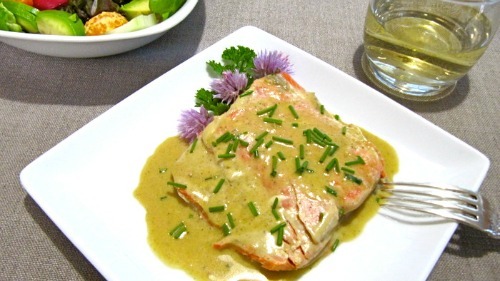 Prepare salmon fillets and grill, or poach the salmon fillets in dry white wine until just done while making the sauce. Keep warm until sauce is complete. Heat olive oil in a saucepan over medium heat. Saute shallot, garlic and ginger until shallot is soft, about 5 minutes. 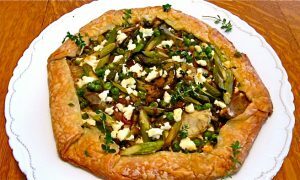 Don't allow shallot or onion to get too brown or to burn. Add vanilla bean, wine, rum and curry paste. Bring to a boil and reduce by half. Add cream or coconut milk, return to a boil, and reduce by half again. Remove sauce from heat and whisk in butter, 1 tablespoon at a time. Remove vanilla bean if using, and press the sauce through a fine strainer. Add vanilla paste if using, then season sauce to taste with salt and pepper. Puddle a small amount of sauce on each plate. Place the salmon fillets on sauce, and then pour sauce over tops of fillets. Garnish with chopped chives or parsley and lemon slices. * Can be found in Asian specialty stores and frequently in large supermarkets.